Create a transformational look that lasts from day to night with these five essential brushes, each designed to provide custom coverage. Whether you are touching up unevenness throughout the day or amping up your pout for night, these brushes will provide you with the best results to accomplish your transformational look. Store all of your brushes in this sleek & versatile clutch that goes from day travel to glamorous night. The brushes come in a separate plastic sleeve, that I have since discarded. The clutch doesn't really look like a "clutch" - more like a cloth makeup brush holder. so works great as a brush holder to prop up on the table. 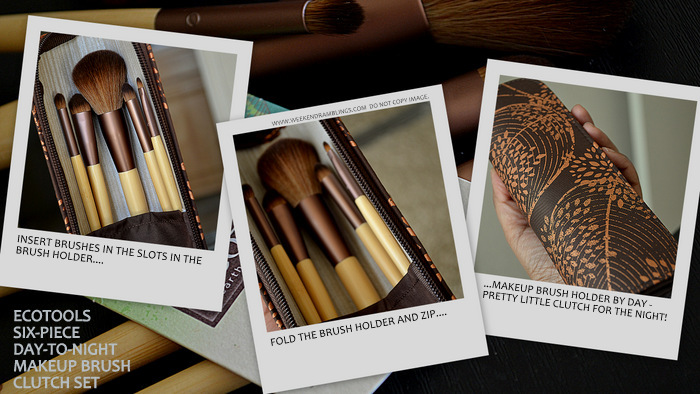 It can be folded and zipped close into a clutch/brush holder for travel. Lipliner Brush - I thought this was an eyeliner brush (like the Maybelline one) unril I saw the description written on the handle. It is a synthetic brush, and the perfect tapered shape for eyeliners, so that is how I will be using it! Smudger brush - Short pencil brush. Supersoft bristles. Perfect for smudging eyeshadows/eyeliners. in any nooks and crannies on the face - for me, it's the undereye area. Eyeshadow Brush - A fluffy shadow brush that can be used on cream products too. Powder Brush - Soft bristles, rounded head - perfect! Can also be used for blush. night-time clutch, but it would be very useful for travel. Rads.. this set looks tempting... I am in love with your photography skills... Which camera do you use Rads? I discovered your blog only recently and couldn't just read and leave. You have a lovely blog and the photographs you post are fantastic and professional! I have added you to my favs. May I ask what camera do you use? Loving these brushes and the price is a bargain! They are quite good :) :) And, that's a lovely blog you have!